The junction of the Nottingham Canal with the Cromford Canal at Langley Bridge. 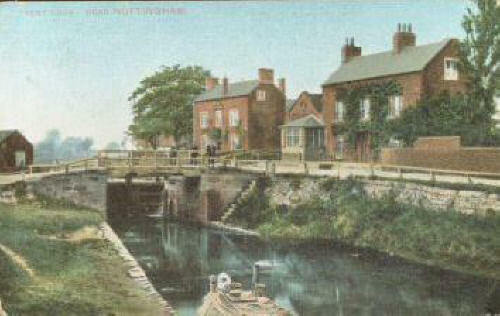 The houses on the left are long gone, but the canal toll-office on the right and the house on the right still remain. Although the Nottingham and Cromford Canals are no longer in use, the Langley Mill basin still attracts many visitors along the Erewash Canal. The public house at the side of the basin, the Great Northern, was, before the coming of the railways, called the Junction Navigation. Almost 12 miles away from Langley Mill, Trent Lock, near Long Eaton, is the start of the Erewash Canal. This postcard is dated 1906, but many of the buildings appear the same today. The Erewash Canal, completed in 1779, was joined along its length by several other canals: not only the Cromford (1794), and the Nottingham (1796), but also the Nutbrook (1795) and the Derby (1796). 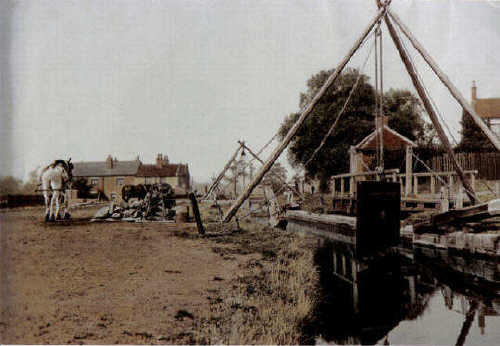 The Erewash Canal was bought up by the Midland Railway Company fairly early on (as was common practice for the early railways, so that they controlled their opposition), but it remained in use for longer than any of the others in our area - it was bought by the Grand Union in 1932 and was still in use after the war. The last commercial narrow boat unloaded for the final time in 1952, and the northern part of the canal was formally closed in 1962. That, however, was not the end of the story.... 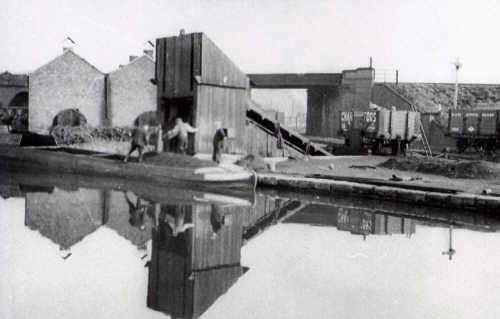 In 1973, following the tireless efforts of the Erewash Canal Preservation Association, the canal re-opened, and it gained full "cruising waterway" standard in 1983.
showing coal being loaded onto a barge. Just as the Erewash Canal was re-opened and preserved, so now too there is a major campaign to re-open the 14 miles of canal between Langley Mill and Cromford. This will be a mammoth task, as part of the old canal route has been opencast, the Butterley tunnel has been out of use for a century, and there are now demolished aqueducts to be rebuilt. 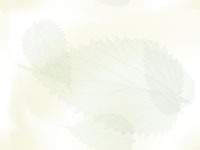 The campaign goes on, though, and the Friends of the Cromford Canal are fighting hard for this route to be developed.